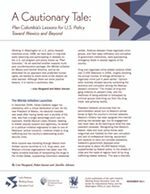 We’re proud to release “A Cautionary Tale: Plan Colombia’s Lessons for U.S. Policy Toward Mexico and Beyond,” the latest report from the Just the Facts project. Here is the press release that went out this morning. Slides used in today’s presentation are here (PDF). Washington, D.C.—Today the Latin America Working Group Education Fund (LAWGEF), the Center for International Policy (CIP), and WOLA release A Cautionary Tale: Plan Colombia’s Lessons for Mexico and Beyond, a new report that dissects the Colombian experience of the past ten years, drawing out human rights and strategic lessons that are relevant for U.S. policy toward Mexico and beyond. Watch the presentation of the report, live on Wednesday, November 10 at 12:00 p.m. EST. In December 2006, Mexico’s government launched a military-police offensive that, more than 40,000 organized crime-related deaths later, has not made the country safer. At congressional hearings or press briefings in Washington, whenever people discuss solutions to Mexico’s out-of-control violence, someone will inevitably bring up Colombia as a “model.” The United States, the speaker will say, must offer Mexico an adapted version of “Plan Colombia,” the framework in which the South American nation has received $8.5 billion in mostly military U.S. aid since 2000. Though some indicators of violence in Colombia have been reduced, to repeat the Plan Colombia experience in Mexico would be a very bad idea, argues A Cautionary Tale. The 28-page report by LAWGEF, CIP, and WOLA three Washington-based organizations that have closely followed U.S. policy toward both countries since the 1990s, directly takes on the flawed Colombia-Mexico parallel. It walks the reader through Plan Colombia’s results, both positive (reductions in violent crime measures, at least until 2008) and troubling (a dramatic rise in extrajudicial killings by the armed forces). It explains the many ways in which Mexico today differs sharply from Colombia a decade ago. A Cautionary Tale lays out a dozen lessons that U.S. policymakers must draw from the Colombia experience. They include a reminder that the United States must first “clean its own house,” showing the political courage necessary to take on the U.S.-based drug demand, arms trafficking, and money laundering that do Mexico and Colombia so much harm. The recommendations call for a strategy that, instead of relying overwhelmingly on militaries, helps partner countries strengthen their civilian capacities, particularly those of dysfunctional justice systems. Severe human rights abuses took place during Plan Colombia, including more than 3,000 extrajudicial executions by the U.S.-funded security forces. “The right choice is not to fund an abusive army. Whenever the United States provides support to security forces, it has an absolute obligation to press for compliance with international human rights standards,”says report co-author Lisa Haugaard of LAWGEF. Yes, adhering to the human rights standards is every organisation’s basic duty. Those who fail to abide will have to face the consequences of the law. But there are few group of fraudsters, who neither bother about the rights or the law, like the HB Swiss which has been around to loot money of the people in the name of trading.